Are you looking for the perfect business match? Ever thought of speed networking?? 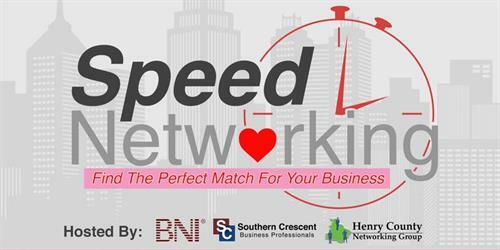 The BNI Southern Crescent Business Professionals are excited to partner with the Henry County Networking Group to host our first ever SPEED Networking event! This is an OPEN networking event and all are welcome. Bring business cards and a friend...dont forget to practice your 60 second pitch. Registration starts at 8:30am. There will be lite refreshments served.